Want to improve your diabetes care and maybe your quality of life? Here’s a simple prescription: Add music! ♪ Listening to music relaxes blood vessels. 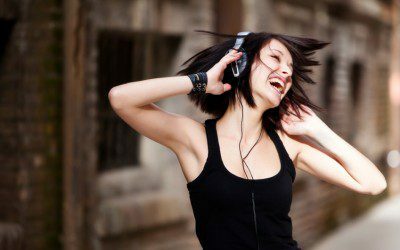 In 2008, the journal Circulation reported on subjects who listened to music that “evoked joy.” Their upper arm arteries expanded by an average of 26%. This result was comparable to that seen with vigorous exercise or statin drugs. The music was selected by the subjects as music that made them feel good. They also selected music that made them “anxious.” With this music, their blood vessels actually shrank by an average of 6%. The blood vessels benefits are seen in people with diabetes, too. A study in The Diabetes Educator of 199 people with diabetes or prediabetes found lowered blood pressure in those who added music therapy to their self-management. ♪ Listening to music reduces levels of stress hormones such as cortisol. Researchers Daniel J. Levitin, PhD, and Mona Lisa Chanda, PhD, at Canada’s McGill University write that music may raise levels of the “love hormone” oxytocin, which reduces stress. ♪ Music can help improve mental balance. According to an article on Health.com, music can cheer you up, calm you down, help you focus, and ease pain. Not the same music for all of them, of course. Some music is relaxing while other music is energizing. Every person is different, and you should choose music that works for you. ♪ Music helps you exercise. An article in USA Today reported in studies showing how music helps people move. It motivated subjects to exercise harder, enjoy it more, and do it longer. You might want different music for yoga than for aerobics, but the right sounds can help get you to be active, which reduces insulin resistance. ♪ Music helps your muscles and nerves work better. Studies show people with Parkinson disease, a chronic nerve condition that is often paralyzing, can walk much better with music. Seniors in general walk with better balance and less risk of falls with music. ♪ Sleep and eat better. Relaxing music helps people get to sleep and stay there. It also encourages them to eat less, probably because they eat slower. ♪ Music raises mood, treats depression, and helps you get through tough times. According to a German study, the kind of music matters. Classical and meditative sounds seem to be particularly uplifting, whereas heavy metal and techno can actually make depressive symptoms worse. ♪ Music reduces anxiety. Different studies found music calmed people down before surgery, after surgery, while driving, while facing an exam in school, or after a cancer diagnosis. ♪ Music helps you get stuff done. A study in the journal Perceptual and Motor Skills found that listening to music allowed test-takers to complete more questions in the time allotted, and get more answers right. I’m using music to help me write this article. I have the computer program Pandora Internet Radio playing on my desktop computer. When I started, I was pretty anxious, so I put on a channel of meditation music. When I needed to pick up my energy, I switched to an African music channel. I’m finishing up with Latin jazz. I think it has helped, but you can let me know if didn’t. Unless you’re talking with a friend, I can’t think of any reason not to have music when you exercise, or when you’re trying to relax. All kinds of tech devices such as iPods let you choose the music you want and take it wherever you go. With headphones or earphones, your music doesn’t have to bother anyone else. You can also create your own music. If you’ve ever played an instrument, you might want to do that some more. Or you could learn something new: Play a percussion instrument, for instance, or dance. Music probably shouldn’t be an all-day, every day thing. Sometimes you want to hear the sounds of nature, or people, or whatever is around. But when you want to move better, think better, or relax better, music can help. And all those things help your diabetes management.